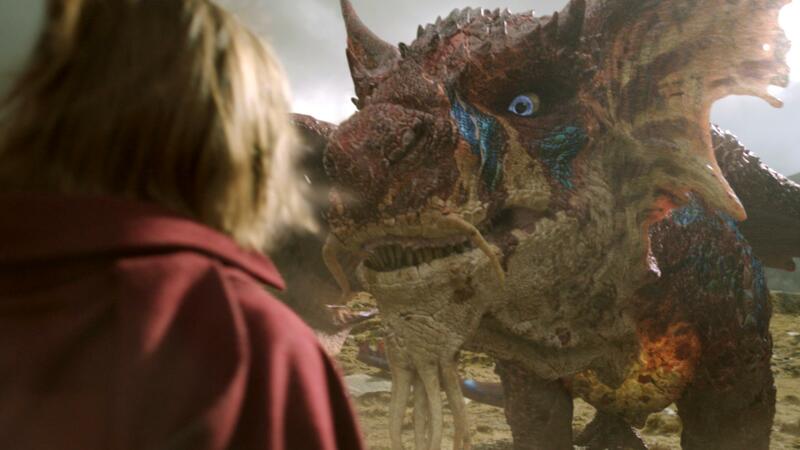 Milk created the visual effects for The Last Dragonslayer, Sky 1’s Christmas Day drama feature for 2016. Our focus was the conception and animation of hero dragon Maltcassion, voiced by Richard E Grant. Milk created the BAFTA nominated digital visual effects for Sky One’s record breaking feature-length Christmas Day drama. We delivered 160 shots and were responsible for the conception and animation of hero dragon Maltcassion. The Milk team had the pleasure of working closely with Director Jamie Stone to develop the dragon using descriptions from Jasper Fforde’s book and concept boards designed by Jamie’s team which we handed over to our in-house concept artist for the final tweaks. Our brief for Maltcassion was to create an old yet powerful, proud, colourful dragon with an elegant and majestic physicality. We developed dragon design variations using cockerel colour references of red, yellow, orange and iridescent black and blue. We worked with photographic references of, amongst other creatures, turtles, komodo dragons and salamanders. Our collaboration with Jamie began in pre-production to plan the dragon’s size, shape, proportions and movement. We created an early 3d dragon model for pre-visualisation as well as some rough geometry for main character Jennifer Strange and the geographical location so that Jamie could previsualise Maltcassion’s interaction with Jennifer – all of which helped dictate key camera angles, lenses and the timing of his fly-through shots in particular. When Jamie first started his editing process, he made the decision to shoot some shot specific animation using toy plastic dragons which he had comped in in the Avid to give us a great starting place for our layouts and really helped us understand what he was trying to achieve very quickly. Once Maltcassion’s size and design were approved we began adding detail to his geometry. When the model was finished we hand painted his flesh, scales, wrinkles and skin pores, making sure the colour patterns reflected as closely as possible the approved artwork. As Maltcassion is able to talk, our animation team hand animated the lip sync to dialogue recorded by actor Richard E Grant. To further enhance this this we designed a helmet camera for facial motion capture which the actor kindly wore when he recorded Maltcassion’s voice. Our animators used this to interpret the nuances of Richards’s performance with our facial rig which allowed us full control over every muscle giving us access to a full range of emotion. The real key to Maltcassion’s emotion and expression were his eyes and for that we took close reference from Richard E Grant’s eyes which Jamie felt worked really well. We even added some of the actor’s facial asymmetry and scars to further enhance his character. In developing his movement style we ended up with a blend of creatures including a lion for the main skeleton and muscles, bat references for the wings and a lizard for the tail. Maltcassion’s age was a key consideration for the team as he is old and needed to look slow and majestic. It was a fine balancing act as if his movements were too quick he would look young and light; too slow and he would look like he would never be able to fight or fly. We set up a joint based facial rig using curves to represent the muscles of the face which the animators could control to produce realistic facial expressions. We used a hair system to move the dragon’s beard and moustache so that they would react to the movement of his head. The final details included sub-surface scatter to give translucency to his ears and wings and an iridescence for the peacock blues and greens on his back which changed depending on lighting direction. Our CFX team gave us skin that slid over his muscles and flesh that wobbled subtly when he stamped his feet. We also developed the ability to dilate his pupils and stick his lips together slightly as he spoke. All of these finer details add to his nuanced performance and tie all the work together.